We’re excited to announce that last years Instagram competition is returning in force. It’s time to wipe the dust of your cameras (well, metaphorically) and once again, begin snapping your favourite Baltzersen’s moments! Oh and we almost forgot to mention, there’s free coffee and cake on the line. Who can turn that down, right? Cue the return of Baltzersen’s Wall of Fame, where each winner’s photo will be proudly displayed in our café for all to see! 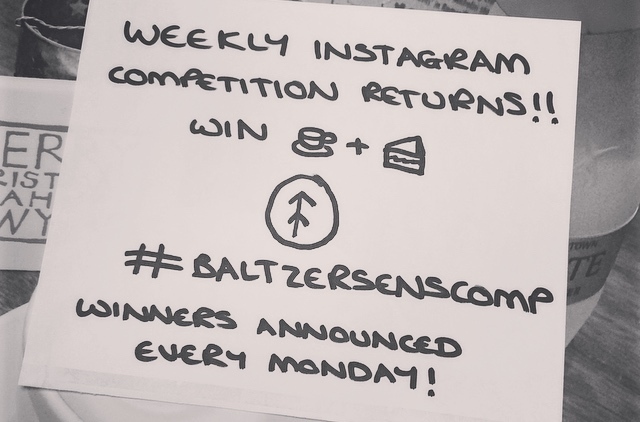 We really do hope that you enjoy the return of the competition and enjoy participating in the world of Baltzersen’s. We love engaging with you, so we felt it was the perfect time to share how YOU see the wonderful world of Scandi food and drink. The competition went down really well last time out and we’re sorry that it took us this long to get it back up and running. We can’t wait to see the photos you have to offer. A RECAP: How to enter. 1. Take a picture of your Baltzersens moments, being as unique and artsy as possible. 2. Upload it to Instagram with the hashtag #BaltzersensComp. 3. We’ll do the rest, announcing the winners on Monday mornings. The snapper that makes us smile/laugh the most will win free coffee and cake for two! The competition will run weekly, with a new theme announced every week (Tuesdays)! The first week’s theme will be simple: coffee and cake. After all, it seems appropriate as that’s what two lucky people will win! The winners photo will be displayed on site for a week following their victory. So what are you waiting for? Get snapping and enter for your chance to enjoy Baltzersens for free. Like us on Facebook (https://www.facebook.com/baltzersens) and follow us on Twitter (https://twitter.com/Baltzersens) for regular updates. Don’t forget to follow us on Instagram for competitions and pictures of all we do at Baltzersens.